Do you or your partner snore so loudly and frequently that it’s affecting not only your quality of sleep but your quality of life during the day? 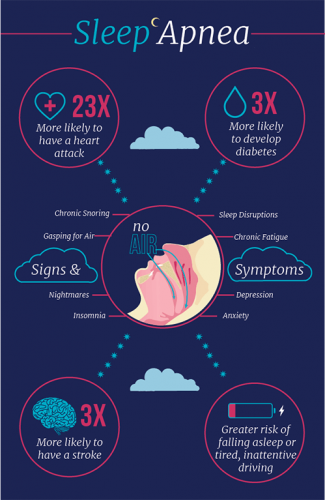 Did you know that loud, frequent snoring is one of the many signs of sleep apnea, and that left untreated, you could be at risk for serious systemic health problems, and even death? The good news is, Dr. Shih at Waterloo Heights Dental has received advanced training for sleep apnea treatment in West Salem! Schedule a sleep apnea consultation with Dr. Shih today to take control of your nights, your days and your overall health and wellness. Obstructive sleep apnea (OSA) is a common and dangerous sleep disorder that affects millions of Americans, while many cases remain undiagnosed. Because symptoms are mostly present during sleep, it is not uncommon to see patients who have been suffering from sleep apnea for years and had no idea. Sleep apnea occurs when the soft tissues in the back of the throat collapse during sleep, obstructing the airway and making it difficult for the sufferer to breathe properly – or at all – throughout the night. Patients with sleep apnea will often wake up feeling exhausted after what should have been a full night’s rest. At Waterloo HeightsDental, we take sleep apnea seriously because it not only affects your quality of sleep but your quality of life during the day and can lead to serious systemic health problems – and can even be deadly. We provide a convenient way to test your sleep at home. We use the most clinically validated home sleep test, the WatchPAT system that you’ll wear like wristwatch at night that monitors every time you stop breathing, your oxygen levels, and more. This will help us determine if your sleep apnea is mild, moderate, or severe so we can come up with a personalized treatment plan for you. At this point you may be wondering, “How can a dentist treat my sleep apnea?” Traditional sleep apnea treatment usually involves a CPAP machine, which many patients find intolerable because the machine is loud, bulky and uncomfortable. Sometimes in severe cases doctors must resort to invasive surgery. Your West Salem dentist offers a highly effective, non-invasive, convenient alternative for sleep apnea treatment with oral appliance therapy. Oral appliance therapy uses a special device, an oral appliance that you wear like a mouthguard during sleep. The appliance gently shifts the lower forward, thus preventing the airway from collapsing and allowing you to breathe comfortably throughout the night. Oral appliances are custom-made for the perfect fit so they are as comfortable as possible – made just for you! Oral appliance therapy has truly revolutionized sleep apnea treatment as we know it, and is a far cry from invasive surgery or a CPAP machine. If you’ve been diagnosed with sleep apnea, or have noticed any of the above signs and symptoms, Dr. Shih would love to help you take back your nights, your days and your life with a simple, affordable solution! If you’re ready to take control of your sleep apnea and invest in the future of your overall health and wellness, you’ve come to the right place. Contact your West Salem dentist, Dr. Shih at Waterloo Heights Dental today.